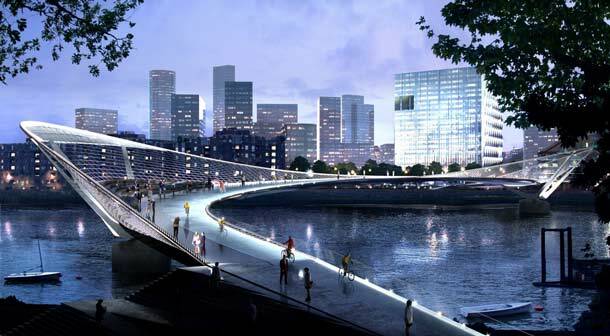 Wandsworth Council have announced a public showcase of initial design concepts for their cycle bridge proposal which could obliterate Pimlico’s last bit of green, open space by the River. The competition to design a suitable crossing to connect Nine Elms more directly with the North side of the Thames has apparently caught the interest of up to 80 international design teams who will be displaying their ideas at this brief exhibition next week. Pimlico residents are invited to have a look and make up their own minds about the possibilities. The designs will be anonymous to keep the focus of attention on the concepts and will be published can be seen on the Gallery page of the NEP Bridge Competition website. The exhibition is being billed as an opportunity for people from across London to have their say, though they haven’t yet given details of how that might actually happen. Until there is a feedback system, please tell us what you think and we will compile all your comments, anonymously, for their attention – use the Contact Page or the comments section at the bottom of this page. Following this exhibition, a jury panel will reduce the proposals down to a shortlist of up to four teams to go through to the next stage. The jury panel members include Wandsworth Council leader Ravi Govindia, architect Graham Stirk, engineer Henry Bardsley, CABE chair Pam Alexander and Lambeth Council’s Joanne Simpson. Wandsworth have privately invited a couple of Pimlico residents to join the Residents’ Review Panel which can pass comments to the jury. We can’t find any public representation for Pimlico or Westminster. The “final location will not be agreed until Stage 2 of the competition. So, at this stage, competitors are being asked to think about five universal challenges that will need to be addressed, regardless of location”, but then again, “it is likely that either Option 1 or Option 2 from the TfL will be selected”. The bridge location options and its integration into the transport system have been a source of contention and Wandworth have simply pointed the designers at their preferred choice which goes from the American Embassy to Pimlico Gardens (and Shrubbery). They haven’t done a transport integration study and the bridge doesn’t seem to be part of their own cycle plan. Read some of the background here: Troubled Bridge Over Waters (2013). Wandsworth’s preferred option would land in Pimlico Gardens (and Shrubbery! ), the under-appreciated but last remaining patch of open Riverside green-space. The original 2013 Nine Elms Bridge Feasibility Study (PDF) identified the Achilles heel of the bridge design: There isn’t enough space on the Pimlico side for a ramp with a safe gradient, so riders would need to dismount and use the stairs, probably four flights, which would have wheeling ramps. There would be two elevators capable of raising and lowering cyclists and their bikes, but these would carry a maximum 300 per hour at peak demand, leaving 2,000 per peak hour cyclists using the stairs. Doesn’t bear thinking about. Funnily enough, the same problem seems to exist on the Nine Elms Wandsworth side because the developers have made no accommodation for a ramp there either. Let’s hope that the architects can design us out of this jam. Separator image Posted in Blog, Planning and tagged with bridge, nine elms, transport, wandsworth.